Menorca (or Minorca) is one of the Balearic Islands, the little sister of Majorca and it is the perfect spot for a relaxing holiday in the sun. It’s the best place to go if you want a peaceful retreat. Partygoers will find Menorca a bit too boring but for those who want to get away from it all and just have some peaceful time then Menorca is the perfect island! Menorca has many great beaches on its coastline such as: Punta Prima, Cales Coves or Cala en Porter. The natural beauty of the island truly brings you back to the times when everything was so simple yet so amazing. To make your holiday arrangements you can pick a low cost holiday to Menorca from hundreds of offers out there. In Menorca you can enjoy delicious seafood dishes in different small restaurants. You won’t get anything frozen here as they only serve fresh sea food. You’d love the lobsters! Es Pla is where King Juan Carlos I would go to have his lobsters. Yes, you can also try the same lobsters he enjoyed as you order the caldereta de langosta. If you don’t fancy that then try a delicious paella. One thing you should also try in Minorca is a glass of pomada (which is Mao gin with lemon) or formatge the Mao (a local cheese). The last Wednesday of August is a day of fun in Bunol, a town near Valencia (Spain) as the La Tomatina Festival is being held on that day. 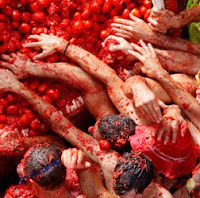 Thousands of people flock to Bunol from around the world to take part in the battle of tomatoes where thousands and thousands of ripe tomatoes are thrown around the town that leaves the street filled with tomato rot. It’s not just a tomato throwing activity although it is its highlight but it’s also a fun activity with parades and dancing with great music and fireworks too! Before the tomato fight, there is a contest for paella cooking. Bunol has a population of around 9,000 but during the La Tomatina Festival, the number of people in this town balloons to over 30,000 people. 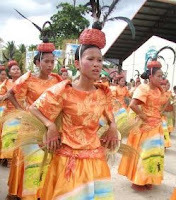 Of course with the sudden increase of people coming here, the hotels and inns could not accommodate the visitors which are why many would come and stay at Valencia which is just a bus ride away from Bunol. It is indeed a fun activity and it’s a harmless fight of tomatoes that can still hurt you especially if thrown at a far distance so be warned and wear the necessary protection. Rotten tomatoes stink too but it’s a lot more fun that way. The La Tomatina Festival had been featured in travel shows worldwide several times already and it’s a pride of Valencia, Spain. The capital city of Tuscany has a lot to offer to the visitor. From art to history, Florence is a fascinating city. The artistic heritage of the city is impressive. You can find here works by Giotto, Andrea Pisano, Brunelleschi, Donatello, Leonardo da Vinci and Michelangelo. The buildings in Florence are amazing: Palazzo Vecchio, Palazzo Pitti, monasteries and cloisters. The richness in art can cause the Stendhal syndrome for first time visitors. If you are more an active type, why not try Calcio Storico (historic football)? It is a traditional sport seen as the forerunner of soccer but actually the calcio storico resembles rugby. Its origins are in the Middle Ages when noblemen were amusing themselves playing in impressive costumes. Nowadays a temporary arena is built in Piazza di Santa Croce and there are four teams: blue, white, red and green (coming from different quarters of Florence). The restaurants in Florence base their meals on meat because the local cuisine is of peasant traditions. Try the antipasti crostini toscani, a ribollita soup and a bistecca alla fiorentina all served with olive oil which is produced in Tuscany. Santa maria del Fiore Cathedral - the fourth biggest cathedral in Europe. Casa di Dante - the house where Dante grew up and which was rebuilt in 1910 and became a museum to Dante. Palazzo Piti is a Renaissance palace on the south bank of Arno river. The palace has a huge collection of paintings, jewelry and precious objects. In the 18th century the building was used as a power base by Napoleon and after that it was the royal palace of the united Italy. The latest incident of an airline crashing into Hudson River has shown a couple of achievements – among them is how technology spreads news like wildfire. Aside from the obvious news that the pilots and the rest of the crew never had serious training for this incident, photos and updates regarding the passengers were circulating online via Twitter before any major news network picked up the news. For those unfamiliar, Twitter is regarded as the next generation blogging platform. Instead of the usual blogs, Twitter will only allow you to post up to 140 characters. This form of blogging is called “micro-blogging” and the post could be implemented from practically everywhere especially from your mobile phone. Photos could also be posted as well to the same account directly from mobile phones. Twitter is now being adopted by practically everyone especially well known personalities in certain industries and travel is not exempted. Visit three or four websites owned by travel industry personalities and be sure that one of them is already “Twittering”. You can follow their updates from your own Twitter account. From their tips you can get real time updates on travel deals, news about the travel industry or simply their reaction on certain travel news. The best part of Twitter is that you can also react to their posts and the author of the posts should be able to see them in real time as well. Adopt the latest in blogging technology. Twitter and other micro-blogging tools will help you get in touch with as many people as possible which could greatly help your knowledge about the travel industry. In Whakatane, New Zealand, you can come and swim with the dolphins or watch the beautiful and gigantic whales. It’s a lot of fun and even kids would surely enjoy this amazing adventure. It surely is a kind of experience that you will never ever forget. Lots of tourists flock Whakatane just to have this experience. There are boat rides regularly that you can book so you can set sail with no worries. Don’t forget to take pictures or home videos while you enjoy being in the company of the kind dolphins and friendly whales. If you don’t want to swim with the whales and you just want to see them, you can just stay in the boat and watch them go near the boat to greet you. Yes, these whales and dolphins don’t fear humans as they are well protected in Whakatane. You could even touch them or feed them as long as you are well supervised by experienced crewmembers. Snorkel together with the dolphins. Lots of people fly from faraway places to Whakatane just to have this experience. Sure there are other places in the world that lets you swim with dolphins but none can compare to Whakatane. You can also meet their friendly whales such as Minke, Orca, Finn and Pilot whales. Whales and dolphins may be the star but seals can also be seen during the duration of your trip. Ocean birds would also be flying on top of you, waiting for some food to nibble so make sure you bring some for these flying friends too.